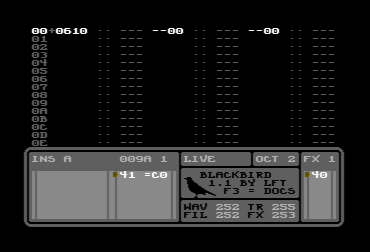 Blackbird is a modern music editor for the Commodore 64. It was released at Datastorm 2017 (outside of the compos). The software has been designed to work well both on real hardware and in emulators, and it comes with a comprehensive User's Guide. For some time, I've been making my C64 music using hacked-together cross-platform tools. Here the various features of those tools have been brought together into a polished native tracker. Thus, the included example songs were not made in Blackbird, but each was made in a conceptually similar tracker, and then converted into the new format. Note: The User's Guide is also included in the zip-file. Here are the CSDb pages for Blackbird 1.0, Blackbird 1.1 and Blackbird 1.2. Hi Linus, I really like your user guide. How did you compose it - TeX? which template did you use? Yes, it's pdflatex. I'm using the regular "book" class, together with packages like "berasans", "fancyhdr" and "longtable". Some lengths are tweaked (e.g. parskip, parindent), the chapter headers are custom (by overriding @makechapterhead) and the keyboard keys are generated using tikz.